WHO CAN USE BEAT IT? Gentle and safe for the whole family. That includes infants, children, and pregnant women. All natural and chemical-free, flea and tick protection for the more furry family members. Don’t let pesky flies spoil your afternoon ride. Pick up our quart size for quick & easy application. mosquitoes, ticks, fleas, black flies, deer flies, chiggers, no-see-ums, household pests, sand fleas, red bugs, bed bugs, ALL BITING BUGS! Beat It was developed in the humid, hot, swampy, bug infested climate of Florida. 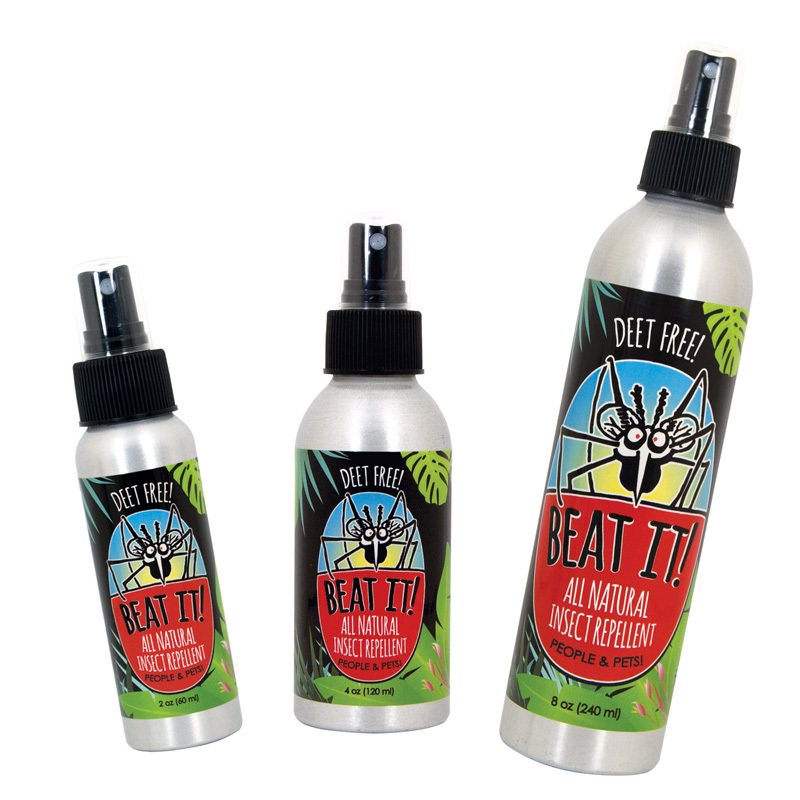 Tested for effectiveness at the University of Florida against popular Deet products, Beat It outlasted them all! Its bug busting strength comes from an essential oil blend of Lemongrass, Cedar, Citronella, and Mint Oils combined with Coconut Oil and H2O. No Deet, artificial ingredients, or chemicals! Beat It not only works great, but smells wonderful and leaves your skin feeling soft and smooth - no sticky residue. All natural protection for the whole family that can last up to 8 hours! This stuff is awesome! I spray it liberally on my skin, my clothes and my hair and not only does it work well, but it smells great too (and I haven’t noticed any stains or discoloration on my clothes). I think it’s probably the most effective non-DEET product that I’ve tried to date; we don’t go camping or running without it! My clients and I have been using BEAT IT! for several years now with great success. Works great on cats, dogs, and horses. I would recommend BEAT IT! to anyone, especially for protecting your pets from fleas & ticks! I took BEAT IT! to the Rain Forest in Costa Rica and had no problems. I didn’t get a single bite!